I took the speech bubble clouds from a Simon Says set called Talk Bubbles 2. I inked up the cloud and then took a knife and cleaned off the little "speech" part. lol. I stamped then in white ink and then stamped them off again for a lighter version. 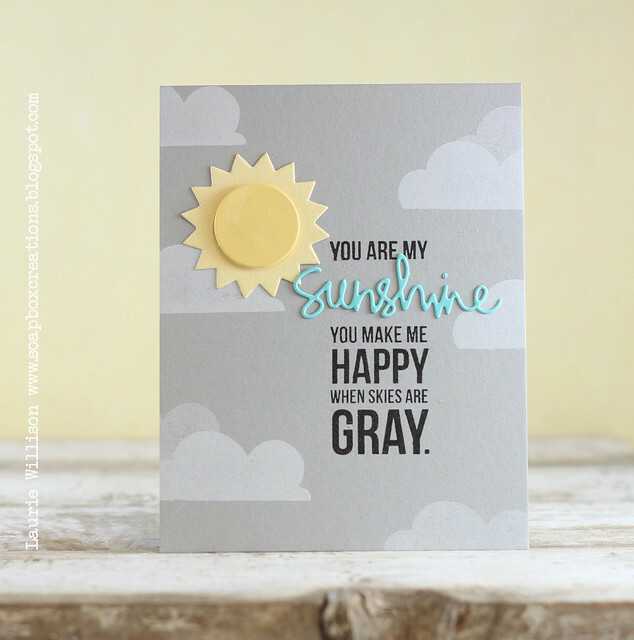 I added in a sunshine from the Sun & Sunshine die set. To give it a little dimension, I added n a 1" circle popped up with foam tape. 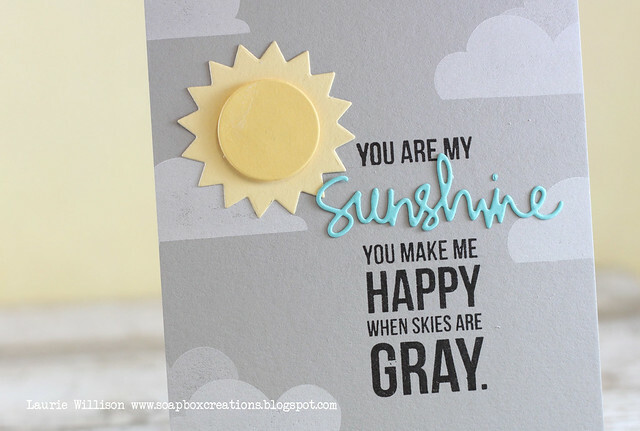 I masked off the large sentiment and used the Sunshine die in the aqua color to complete the sentiment. I remade this card 3 times. 3 times. Agh! I dropped the ink pad on the front in the first try. Then on the second try the masking didn't work. Third time....a charm! :) Oh and the base of this card? Its Simon Says Smoke card stock. I adore this color! Good stuff! LOVE this! Have fun zip lining! Cute!! Eeek ~ have fun!!! Such a cute card. Love your colours too. I have always loved that saying, its ashame there isnt the other version 'grey' as well. I have hunted high and low and can only find the 'gray' spelling everywhere. Ahh well it will have to be one I admire from afar. This is just so stinkin' cute! Love everything about it - sentiment, clean style, colors, perfection! OH love this card! The colors and the image and that awesome sentiment. LOVE! Love how you were inspired....your card is wonderful! LOVE this card! This might be one of my all time favorites from you. That background paper looks like patterned paper, so precise and perfect and I love the combination of the stamp/die to create the sentiment/lyric! Absolutely wonderful!! I am totally in awe of this simple card that has such impact.